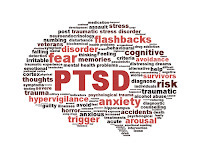 An experimental intervention initiated in the emergency department within hours after a person has been traumatized can reduce PTSD symptoms one and three months later. This finding was reported by Barbara Rothbaum, Ph.D., a professor of psychiatry at Emory University, and colleagues July 6 in Biological Psychiatry. Their study included 137 traumatized subjects, half of whom had been randomized to receive the experimental intervention and half of whom received a control intervention (assessment only). The experimental intervention included imagined exposure to the trauma memory, processing of the traumatic memory material, and image-exposure homework. This is one of several interesting PTSD findings that were reported recently. For example, two variations of genes that control the production of the neurotransmitter serotonin have been linked to PTSD symptoms. Another PTSD study found that Vietnam War veterans are still struggling with PTSD symptoms more than 30 years later. For more information about these studies, see Psychiatric News here and here.